Some people have a tendency to hold onto the past, and even bring back things which happened a long time ago. While others prefer to either focus more on the present, or on the future they have ahead of them. Even goal-oriented people can sometimes find themselves holding onto past situations, and even holding grudges because of it. 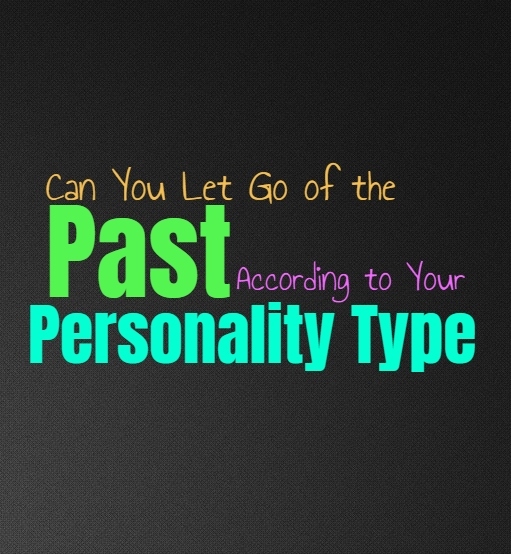 Here is how much you hold onto the past, based on your personality type. INFJs do have a tendency to hold onto memories, but only when they are unable to make more with someone. They try not to hold grudges when they are doing their best to rebuild and move forward in a relationship. For INFJs it entirely depends on the situation and the person, whether or not they are able to let go of the past. They do sometimes struggle to really let go when someone has wronged them so seriously, and will certainly keep these feelings from the past stronger than people realize. ENFJs try to focus on the future, but they do sometimes hold onto past situations. If someone has wronged them then the ENFJ might struggle to really let go of this, especially when it is severe. Small transgressions can easily be forgiven, but when this person hurts them deeply the ENFJ does not let go of this wound. They will hold a grudge and remember those things from the past in a way that people don’t fully understand. Most of the time though, ENFJs believe in focusing on the future and creating something of value. INFPs don’t like holding onto the past and prefer to focus on what is ahead of them. While they try to let go of most things, they do have a part of them which holds onto things without really realizing it. This is why INFPs can often unload on someone when they have been pushed too far. They catalog all of these past transgressions, and can remember everything someone has done against them or others. They will often express all of these horrible past memories at once, when someone has pushed them so far that they feel it is necessary to put them in their place. ENFPs are often see as future focused people who enjoy just going with the flow. While they might seem carefree they definitely have a tendency to hold onto the past. ENFPs remember everything someone says or does, and will often revisit these memories often. Even if someone did not mean their hurtful words, it is impossible for the ENFP to really let go of them. They will remember these things and even use them when they are upset with someone and need to make a case against them. INTJs really try to focus on the future and moving forward and so they don’t often dwell on the past. INTJs focus on the things they can change and work hard to uncover the truth in these situations. They do not hold onto the past in a way that will keep them from moving forward, but they do use information from the past to help them make educated decisions. If someone is capable of changing and has proven this, the INTJ won’t hold a grudge or keep bringing up the mistakes they made before the change. ENTJs try not to let themselves dwell on the past, because they want to focus on moving forward. They care about building a positive future and don’t want to allow their past to hold them back. ENTJs will look at the past as a way to learn and grow, but they don’t hold onto these things in a negative manner. If someone has changed and is learning from their mistakes, the ENTJ doesn’t want to hold a grudge or keep bringing up those moments from the past where they messed up. INTPs try not to let themselves dwell on the past, but they can sometimes struggle to believe that people are capable of changing. They often recall these mistakes and transgressions and might hold them against a person without really meaning to. While they are focused on the future, INTPs do sometimes find themselves stuck in the past in some aspects of their lives. They don’t really let go of things as easily as they would like to sometimes, even though they are comfortable with change in their own lives. ENTPs don’t like holding onto the past, since they prefer to focus on the future. They want to continue progressing and moving forward without allowing anything from the past to hold them back. While in their conscious state of mind the ENTP enjoy focusing on the future and learning to progress, in the back of their subscious they do sometimes hold onto moments and things from the past without totally realizing it. There are times when they can hold grudges against people, simply because that person hurt them so deeply that they lose a sense of trust for them. ISTJs don’t find it easy or natural to let go of the past, since they are very focused on events they have experienced. ISTJs use the past to learn and grow, and so they don’t simply let go of things they remember or have experienced. They live their lives trying to uphold their traditions and for them the past is an important part of who they are and continue to be. ISTJs will remember when someone has done something to harm them or others, and will have a hard time really moving on from this. ESTJs are somewhat focused on the past and so they have hard time just letting go of it. When something has occurred in their past the ESTJ uses this information and learns from it. They also hold onto anything someone has done, or how they might have hurt those around them. For the ESTJ these past situations are important and not something they believe in simply letting go of. This is why ESTJs might be more likely to hold grudges in their lives and struggle to really let go of things. ISFJs are very much focused on their past and so it isn’t easy for them to just let go of this. They use the past in order to build the future they want, and are happier when they feel within their comfort zone. For the ISFJ the past is important and their memories are deeply valuable. Sometimes they can hold grudges because of this though, especially if someone has wronged them or someone they love. ESFJs believe that the past is important and so they do struggle to simply let go of it. When they have something from the past which really affected them, the ESFJ often holds onto this for a long time. They might struggle to really forgive serious mistakes because they continue to remember them and hold onto those things. For them the past is part of who they are, and so ESFJs don’t find it easy or natural to simply let go. ISTPs don’t like holding onto the past and so they can often let go of things fairly easily. They prefer to focus more on the present moment, instead of allowing themselves feel dragged down by the past. ISTPs want to enjoy the world around them and don’t like negative memories or things which no longer affect their lives, to keep them from really living. They are very interested in being able to start fresh and move on from things that don’t bring them a sense of thrill and joy. ESTPs enjoy living in the present instead of allowing the past to hold them back. They can often let go of things from the past, especially if they present is happy and positive. They don’t simply allow these moments or mistakes to keep them from enjoying themselves and living their lives the way they want to. For the ESTP the past is only something which affects them if those things continue to occur in their daily lives, otherwise they can easily let go. ISFPs believe in letting go of the past in order to focus on living in the present. They want to soak up the moment and allow themselves to forgive and let go. If something bad happened in the past the ISFP just wants to focus on the present and try to rebuild something better. They don’t want to hold onto mistakes or things which hurt them, since it can only leave them feeling worse about the situation. ESFPs believe in focusing on the present and want to live for what inspires them in the here and now. For the ESFP it is best to let go of the past, especially if there is hope that things can change and improve. This often leads them to forgiving people for their mistakes, especially if that person appears like they want to change and be a better person now. ESFPs don’t like holding onto things, instead they want to seek out whatever brings them the most joy and love.